Covers are important. They're not the only thing that makes a reader buy a book, but it's the first thing a reader sees. A good cover gives you an idea of the tone and content of the book. A bad one has you thinking that a serious vampire story is a light-hearted contemporary. So let's put covers to the test. I feel like there are two options. One of them, she's a beautiful maiden trapped in a dystopian society called Mechanica or something where everyone is run by machiens or are slaves to machines or are used to run machines, and she's kind of some lone star. Like Snow White. That's what it reminds me of because of the birds. The other thing, is that she's somehow part machine, which would obviously change her ability to love and be cared for and all that stuff. So maybe that's why she looks like that. Oh wait, there's a third. Or she's a beautiful maiden like Beauty and the Beast and some evil robot guy wants to marry her. I think it is a story similar to Cinderella except the woman is an animatronic doll who lives in a steam punk setting? In a kingdom in which humans live alongside mechanical animals and humans, a kind, smart, and pretty-ish but sort of plain princess leads her nation with dignity and grace. The mechanical living things are believed to be non-sentient, that is, until the princess starts to suspect that her mechanical man servant can develop thoughts of his own. They slowly fall in love with one another, in the most rapid way two people can slowly fall in love. However, to prevent a war with the neighboring nation, she has promised her hand in marriage to their cruel prince. She must decide whether to follow her heart, tear an entire people's belief system apart, and inevitably lead her nation to war by pursuing her relationship with her automaton manservant OR maintain her duty to her nation, allow an entire race to be mistakenly enslaved by her countrymen, and endure life as the partner of a cruel leader who may destroy her country and its way of life. Is she holding a shoe? Alternate universe retelling of Cinderella with a world half made of machines. "When 10-year-old Anica's science project goes awry, she learns that things are not always as they seem. Anica is whisked away to a secret kingdom where anything is possible with some cogs and elbow grease. There she discovers an unbelievable secret about her own past..."
sorry, not "her own past," "the human soul"
because she doesn't have one, bc she's a robot. tell me what you think, or suggest the next book in the comments! This is a fun idea! 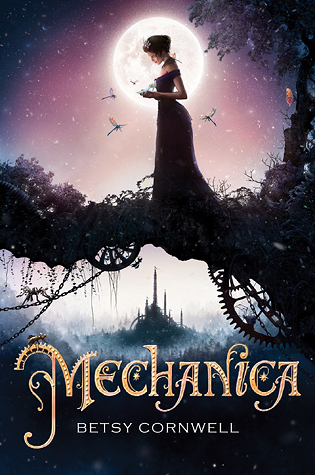 I was a huge fan of Tides by Betsey Cornwell, so I already knew what Mechanica was about...but it's interesting that almost all the guesses had a fairytale element to them.